25 Yoda Inspirational Quotes For Wisdom, Discipline and Growth Mindset - Motivate Amaze Be GREAT: The Motivation and Inspiration for Self-Improvement you need! Movie characters can inspire us when they're created with that very same purpose and inspired by some inspirational people that lived in this planet. The Starwars trilogies have inspired millions worldwide and still to this day are a topic of discussion. One of the most acclaimed characters from the space opera saga is Jedi Master Yoda, one of the most powerful Jedi Masters ever. Yoda's first appearance takes place in Episode V - Empire Strikes Back in an unusual kind of way for a character of his magnitude. He comes too us as a short little green creature that Luke Skywalker found in a swamp covered planet called Dagobah. This creature is annoying but at the same time funny. Why is this important? Because it's the whole building of a climax, when you least expect Yoda "The Great Warrior" Luke is searching for is that little creature. I must confess when I saw the movie back in the day I imagined a great warrior too and couldn't believe it was that little green fellow. From there the whole teacher student relationship progresses from Luke not believing to Luke total commitment to learn from the great master. This is the movie were most of Yoda's wisdom is on display, as Luke is being taught the ways of The Force in incredible inspirational movie scenes. Yoda is wise, disciplined, calm, thoughtful and at the same time funny and powerful. You can see more of him in the second trilogy teaching young Jedis at the Jedi Temple and other scenes were he eventually uses his power in battle. This Jedi Master taught Jedis for 800 years can we have a better source of inspiration for today? Trust us he knows! Yoda's growth mindset is off the chart! Quote significance: Master Yoda advises his student about life and it's the classic good and evil battle. Life is about making choices and taking decisions, but first face the truth don't run away from it chasing some other illusion that will hurt you. Quote significance: Yoda usual appeal to something that requires method and discipline, in this quote it's detachment. Two things we must incorporate in our life and you can do that only by practicing, like Yoda says "train". Train your mind, train discipline and method, learning detachment is important so your mind can't be blind in times of crisis. Quote significance: If you want to become better at what you do, listen to this advice. If you're a writer write, a singer sing, a painter paint, no matter what happens continue to work on your craft. It's not about a profession, it's about becoming and embracing your activity to the fullest. Quote significance: What to get out of a slump? Search for information, someone out there as written about it or someone knows better. Knowledge it's never a waste of time, specially when you're in trouble. Quote significance: This is when Luke is still looking for "Yoda The Great Warrior" and that little green creature (who's actually Yoda but Luke doesn't know yet) is mocking everything he says. In this case Yoda mocks but at the same time teaches and what a deep teaching... He's all about peace and knowledge, wars are not what he craves or desires, therefore they could never make him great. Quote significance: No matter how strong you are there is always something stronger. In this case Yoda is facing death and there's nothing his powers can do about it. Quote significance: Luke is doubtful about everything he complains about the size of the ship "it's too big..." for him to lift it, so like a good teacher Yoda wastes no time and teaches Luke a lesson: impressively Yoda lifts Luke's spaceship out of the swamp with help of the Force and dazzles his student, proving that it's possible! Quote significance: Children are precise and intuitive they haven't been "taught" by society. We need to think like a child sometimes because it simplifies everything. Here the wise Obi-Wan was puzzled he couldn't find a planet but eventually a child could. Quote significance: Again the discipline aspect and commitment. That's what you need also if you want to stand out and achieve great things. Quote significance: This is again from dialogue before the spaceship lifting scene, Luke is still doubtful: lifting rocks is one thing spaceships is another. So Yoda gives the ultimate personal development advice, don't trust your mind, don't believe everything you were taught, you can learn new things that will outsmart those you learned in the past. Keep an open mind attitude, it's all the growth mindset. Quote significance: Thoughts become words, words become actions. Negative thoughts like fear won't lead to good places. Nurture good thoughts. Quote significance: The most classic Yoda quote and again a lesson for personal development. Trying is just trying you're not actually doing it, you're not putting 100% effort. While doing is straight to the point, doing you don't hold back. To grow you need to do! Change your mindset and you'll grow! Quote significance: Life guidelines and again the subject of attachment related to negative thoughts, and those can only make you closer to take negative actions eventually. Quote significance: Another life coach teaching and growth mindset class - if you want to lose your fears you've got to admit and recognize your fears, so you can clearly have a target to aim at. Quote significance Decisions, decisions. That's life! There is always advantages and disadvantages, you must decide pondering on both, this is what Yoda tries to make Luke realize. Eventually he decides to leave and he doesn't destroy everything but it's close: Solo is carbonized, Luke loses to Vader although managing to escape, but you know they lost cause... the Empire Strikes Back! Quote significance: Again the opposites, positive thoughts versus negative. Quote significance: After the lifting of the ship another huge teaching and classic quote. You got to believe something before you can actually do it, if you don't it's more than likely that you'll fail. Once again it's all about the growth mindset one can have in order to achieve his goals. Quote significance: The forbidden fruit looks tasty but it can make you lost and an addict if you taste it. Would you? Quote significance: Simply way of put it, and it can be used for your business strategy, if you know you're doing things the right way but nothing seems to be moving, you should concentrate on changing something, Yoda here states a different game. Quote significance: Jumping to conclusions without knowing everything or because you feel anger towards something, that's kind of a common place for all of us. But we should make an effort to see things from a lucid perspective. One of the best strategies is to put yourself outside of the picture like you'r a spectator of your own life, that gives you an outside perspective of things. Quote significance: So is Anakin "the chosen one" or not. Other Jedi Masters impressed by his skills and power believe he is. But this is kind of popular culture mislead, people tend to jump into conclusions right away. Yoda was always doubtful, so in this quote he lets them know the error was in the reading of the prophecy. Don't believe in everything you're told right away, see it for yourself, create your own conclusions. Quote significance: It's when we are most calm and passive that we can really understand what we want of life. So that means we're Jedis, maybe if we use our power for knowledge and defense. never for attack? Can you do it? Quote significance: Beautiful speech about the Force that Luke knows just relatively, so Yoda articulates further on it. This is all about the spiritual side of life, we must acknowledge it, and work on it also! Quote significance: One of Yoda's life purposes, and coming from this wise teacher, how beautiful it is! 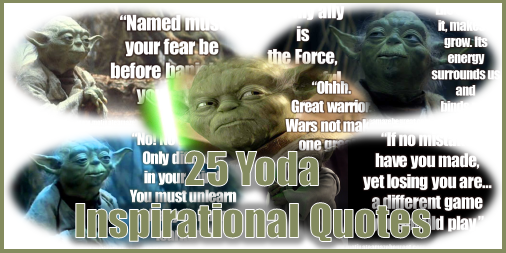 Share what you've learned by reading this Yoda inspirational quotes in the comment section bellow. "Pass on what you have learned" with this quotes by Yoda to your social networks connections so they can to become inspired and adopt a growth mindset for their lives.